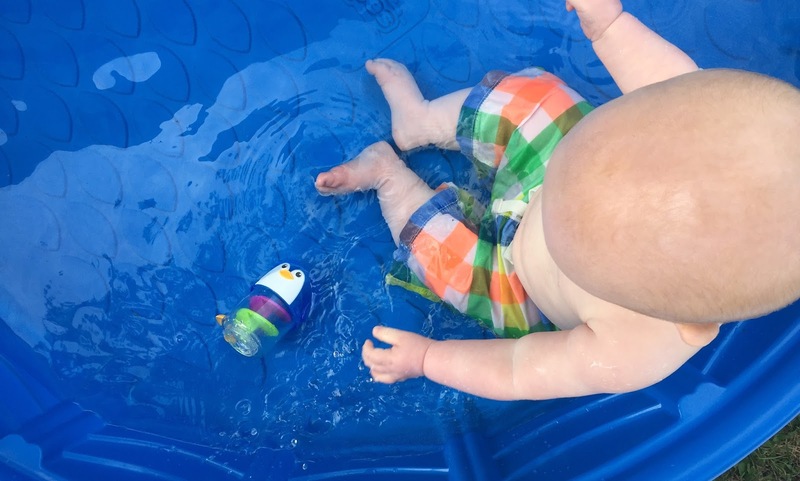 one// Target’s $4 special – the perfect itty bitty baby pool! We discarded our beautiful blow-up pool because it was too much of a hassle to clean and keep our grass happy. This little pool is Spencer-sized, and he just loves it. two// Spending time in the aforementioned baby pool with my little peanut. (Have I mentioned how hot it’s been – and humid?) Last week was deadly, and it looks like this next week will be something else, too. Be prepared for a lot more pool shots. three// Shopping cart covers! Spencer is getting bigger and more independent, and these shopping cart covers are a lifesaver. Almost everything goes straight into his little mouth these days, and the last thing I want is for him to be sucking on a commissary shopping cart handle. Added bonus? He’s strapped in securely, and he loves it! four// I’ve had some time lately with our amazing childcare team of Heidi and Sam to actually run and get some other things – besides work – done. Just this week, I managed to take the time and sew a crib blanket for a friend of mine…a hobby I thought I’d never be able to enjoy again. It was so therapeutic. five// This boy. Simply put, he’s the best thing that’s ever happened to both Ryan and myself; our happiest little accident. I can’t imagine life without him, and I love my husband even more because we have this tiny little man. Linking up this week with Darci for Five on Friday this week.